Japan was an absolute whirlwind, and I loved every second of those two weeks. It was a great opportunity to travel with my friend Lincoln (currently residing in Perth) to meet “half way” and embrace the food, culture, and sights. When googling away at “getting around” in Japan, the JR Pass is sure to come up. We opted for the two weeks, and once I got back home, I did a quick tally of how much we travelled and if it was worthwhile. We juuuuuust made it, if we had travelled any less, we would have lost a buck or ten, however the convenience of having it was great. Once you get there, you will easily/not so easily get the swing of things, but the JR Pass is only used for “getting-from-city-to-city” trains (like the super, speedy bullet train, the shinkansen) and the odd metro line, but most days we would also buy a “day metro pass” in each city to use all of the other lines. There are also so many trains, and even with the pass you can decide on the fly to hop on one of their designated cars. You can also spot Mt. Fiji from the shinkansen if you are heading south (on the right side of the train). Because the train system is AMAZING, it’s basically all we took. We used only two cabs the whole trip, mostly post-karoake so a little later in the night! To make “getting around” even easier, as soon as we landed in Tokyo, I grabbed a portable “wifi spot” that, while added up to about $10 day, made travelling v. v. stress-free. Especially if you’re splitting the cost with a friend, and we didn’t have to bother connecting with the hostel’s wifi. You’ll have to wait a little for a seat, but the Aoyama Flower Market is dreamy, tea and crepes under that greenery, swoon. Now, back to the actual city of TOKYO… the first place we stayed had a neat, minimalistic vibe, called CITAN HOTEL with a coffee shop/bar attached. 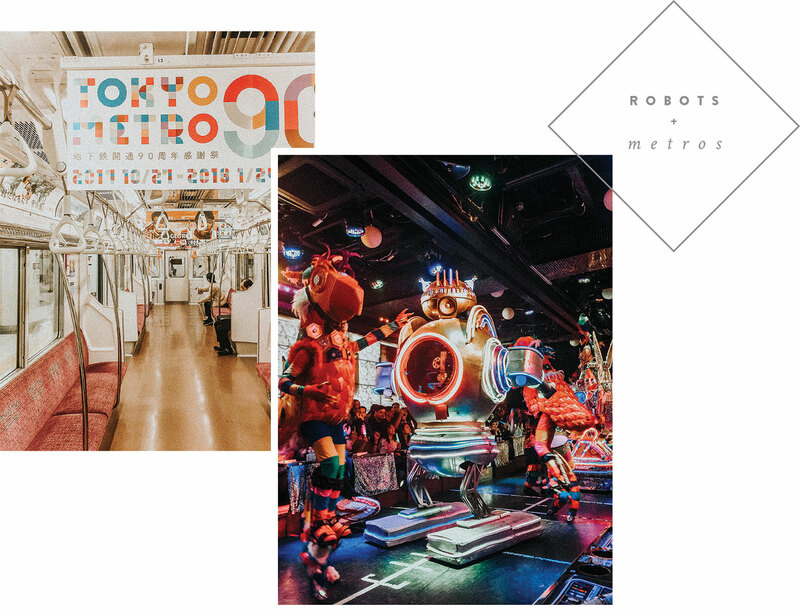 It was a great start off point to explore the rest of the city, from hedgehog cafes to robot restaurants (you honestly write these things and think you’re making them up!). Both touristy, but worth it. Book both in advance, and skip out on the dinner option. 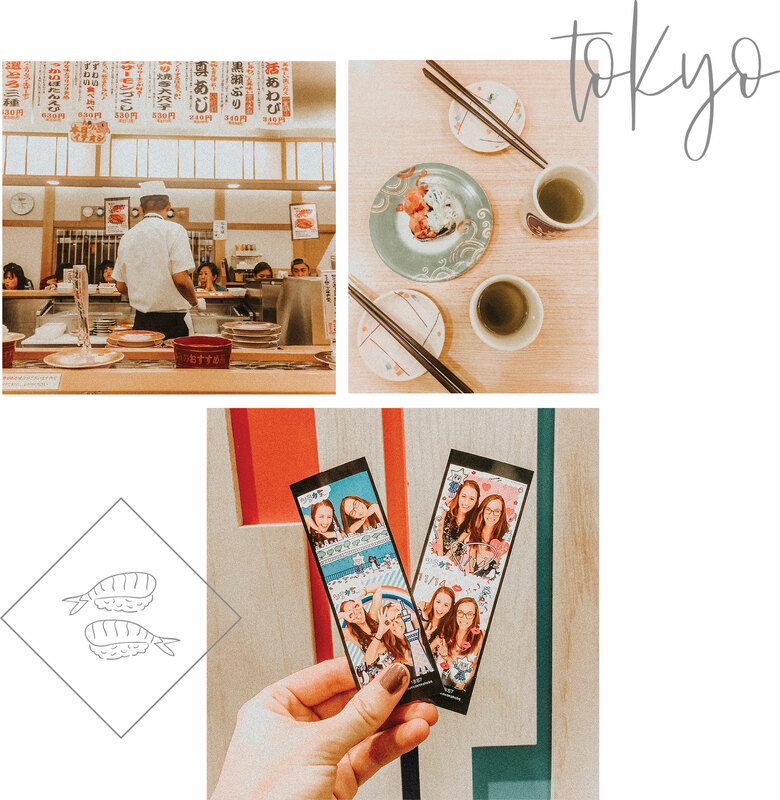 There’s lots of amazing restaurants, from ramen, gyoza to of course sushi, and even right next to the robot restaurant is the infamous Golden Gai area, where some places can only fit a handful of people. Other notable hot spots include the Shibuya Intersection (incredible seeing the amount of people that pass through with each light), Tokyo Skytree (head up to the top for views!) and Harajuku (Gwen Stefani would be proud, this s*&% is bananas). Close by is the Kawaii Monster Cafe, which words can’t even explain what you’re about to experience. A stroll through the fish market is a feast for the senses, and of course there’s Disneyland. We decided to spend a day at Disney Sea, obviously expect the typical wait times, but IT IS “one of” the happiest places on earth. We headed down as south as we were going (Hiroshima) and work our way back up, but really, it’s not that far, and really, the trains are incredible. Hiroshima was one of the most interesting things I’ve ever done, and truly believe everyone should experience it. While WWII was a big part of our history books, my knowledge regarding the Japanese side of the war was quite minimal, and sadly how issues like this are relevant now. We’ll pick up the mood in a sec, but a solid day at the Peace Park and Memorial Museum is a must, and you’ll be amazed how far the city has come. 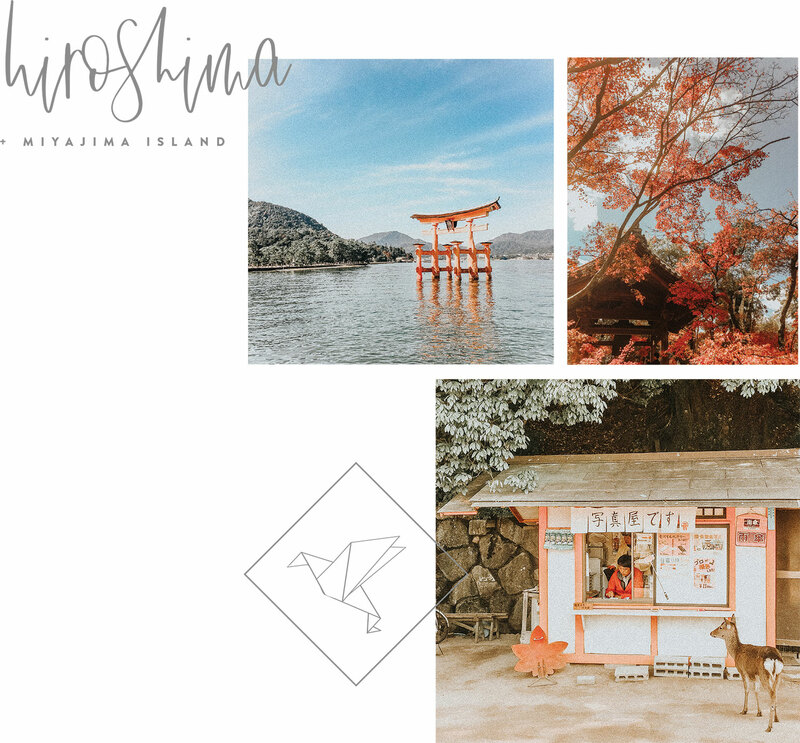 The next day, we took a tram to catch a ferry to Miyajima Island (earlier is key, as it gets quite busy) and your accommodation will have advice on peak times to go depending on the tide. The main attraction is the Floating Torii Gate, so depending on time of year and day, the water level can really change up the look. Be wary of the deer, there’s a lot of them, and even the the travel guides warn you about them snatching your JR Pass. Just remember to not feed or pet them and let them do their thing. Next stop was Kyoto, which I will admit was the toughest to get around (more public buses, less trains). 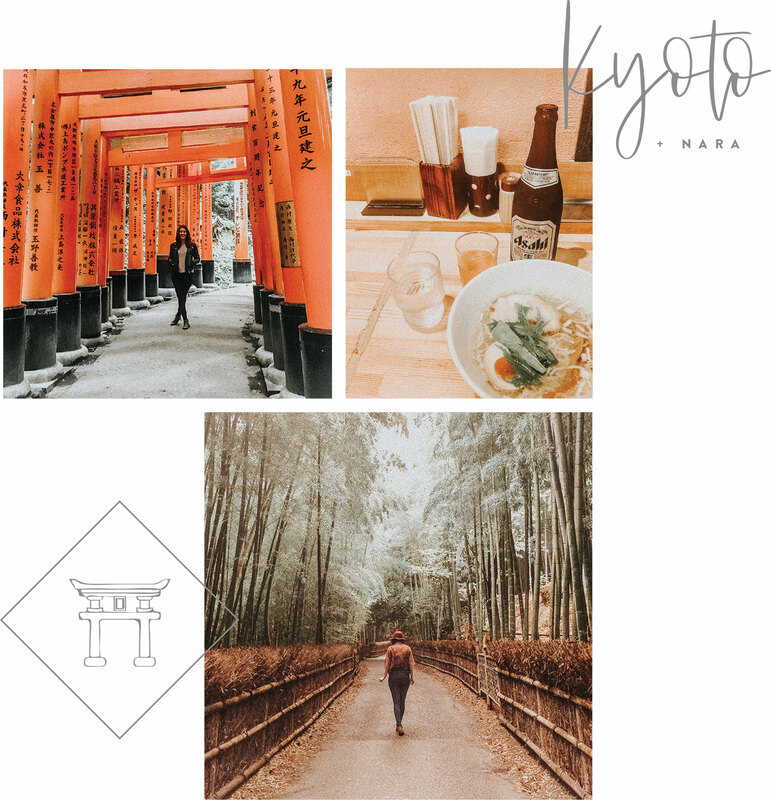 Because of this, we actually ended up missing out on one of the must-do’s, the Arashiyama Bamboo Forest (one of those “travel-mis-hap” stories) however, we still found a “forest” that had “bamboos” so we feel as if we can check it off our list. And of course, Fushimi Inari Taisha is a must do, and wait a bit til you start snapping photos as it gets a lot less busy the higher you get up. Osaka was a funky place, filled with bright lights and busy streets. 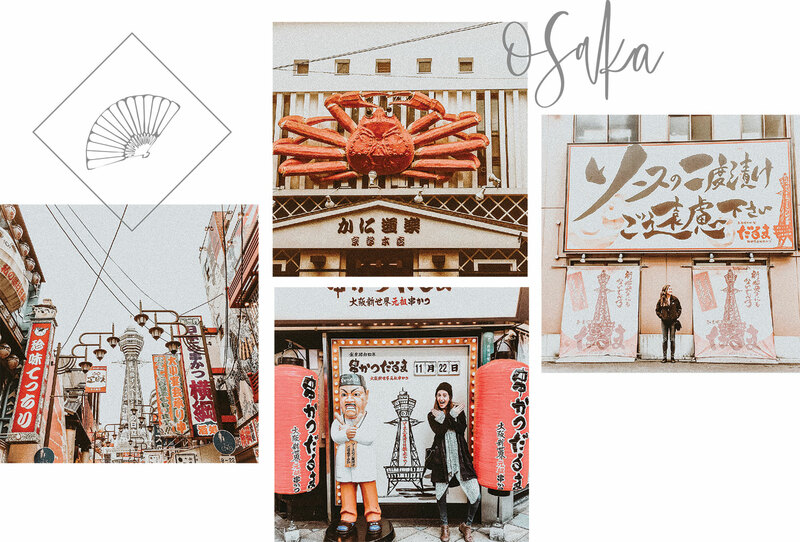 With a few notable sights such as the Osaka Castle, we found ourselves mostly in awe of the different neighbourhoods, walking amongst the streets, such as Shinsekai and Dotonbori. You can easily spend a day at Universal Studios as well. 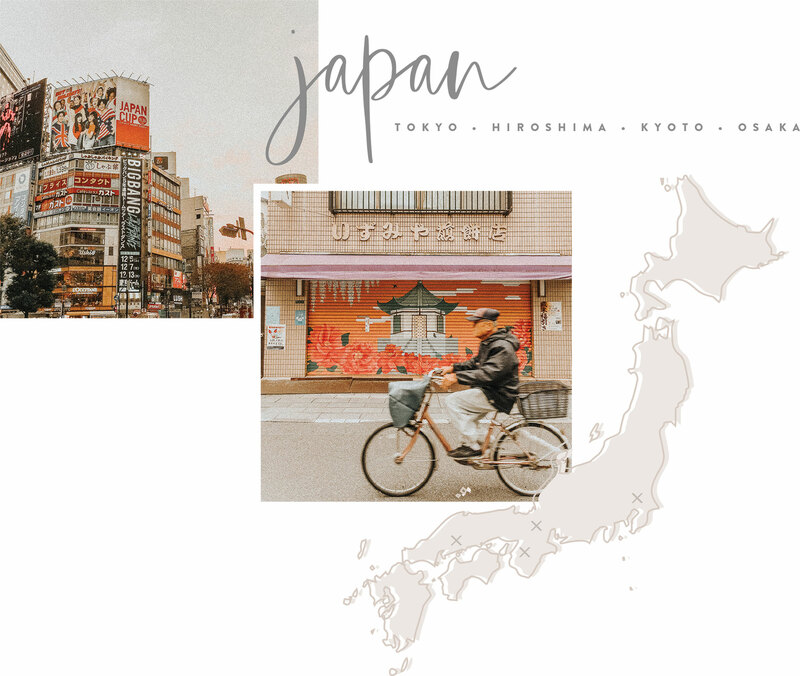 You’ll easily get lost in translation in this incredible country, but amongst the cities is a sense of serenity in Japan’s nature and temples and I can’t wait to go back.